When installing a new kitchen, there are many choices to be made that will affect its aesthetics, functionality and durability. One of the most important choices is that of the countertops, as they are one of the most used elements in the room. Today, there are many options available and things like variety, price and even green rating have made choosing the ‘best’ option quite tricky. When planning your kitchen, you need to be aware of certain factors when it comes to the type of your countertop. To streamline the selection process, Fixr created the below two graphics using 6 key variables. The same 6 variables were considered in both graphics, however, the focus changes depending on the graphic which will be explained further in each section. Installation is one of the first factors; can the contractor access your house with the delivery vehicle and is there space to work the material on site as necessary? Cost refers to the cost implications relating to either the material itself or the installation process. Maintenance looks at the day to day care that is required to ensure the countertop does not wear excessively or get damaged. Durability focuses on how well the countertop stands up to use, including nicks or dents and water or heat damage. Options available refers to the range of options in terms of color or finish that are available for that material or counter type. Stain resistance is the last variable and it considers the surface resistance of the countertop. A marble material or the grout in a tiled countertop may be more susceptible to staining than other options, especially in a kitchen where various acidic or alkali foodstuffs may spill onto the surface. Working with the scores, based on their own countertop installation cost indicator, it is possible to simplify the selection process using a numeric score. The better the product performs with regard to cost, installation, maintenance, stain resistance, durability and options available, the higher the score it has. Here, the focus is on the type of countertop only, without looking at how the material of the countertop affects the outcome. Tiling wins with a score of 22, thanks to the range of options available, its durability and stain resistance and fair overall scores for the other variables. Slab countertops offer a good variety of options, however, have low scores for cost and installation which bring the total score down. 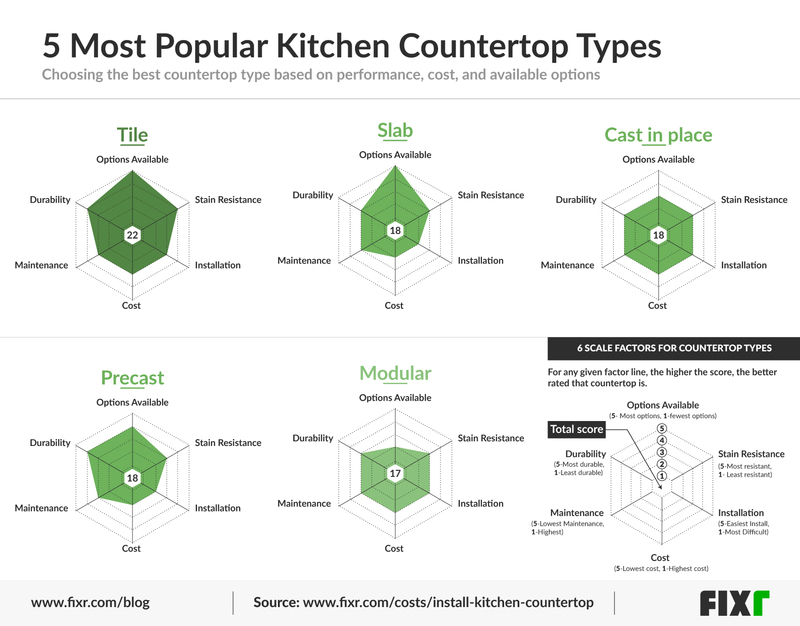 Cast in place countertops have an even, mid-range score across all factors, so are a good option where all variables are equally important. Precast countertops can be costly and tricky to install, however, the other variables, especially durability and the range of available options, help to increase the overall score. Material options have improved in recent years and the list includes traditional options like marble, granite and wood as well as more contemporary options like solid surface, concrete, glass slab, stainless steel, recycled glass, ceramic and quartz. Using the same numeric scoring system as the first graphic, the focus in the second graphic was on how the material scored without consideration of the countertop type. In this instance, quartz, ceramic and recycled glass come out as the best scoring options for material choice. Quartz has most of the aesthetic attractions of natural stone, however, its stain resistance, durability and range of options beat almost all other finishes, leading to a total score of 23. Though cost and installation are relatively high, it pays for itself in the long run. Ceramic comes next with a score of 22, it offers the widest range of options of all and has good durability and stain resistance, but installation, cost and maintenance bring its average score down. Recycled glass follows in third place matching ceramic’s 22, but its main strong points are durability, stain resistance and maintenance, so, once again the choice comes down to your priorities. In order to make your final decision, it is best to identify your top three priorities in terms of the six variables used. 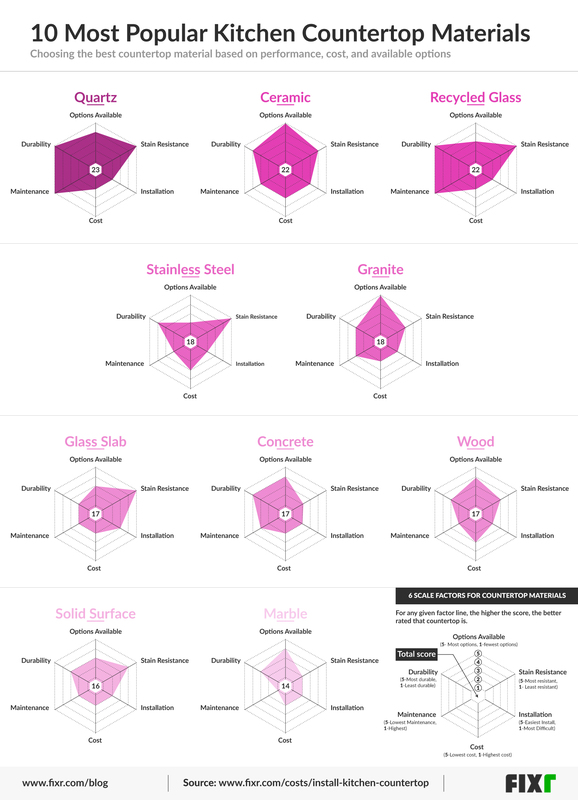 Then, simply find the countertop type and material that have the highest scores for those three variables and compare them against each other to establish the best choice for your kitchen. Of course, there are many other more subtle variables to consider. Environmental implications have become important and even legislated in some countries, so it may be worth considering each material in this light as well. You may find your chosen countertop’s green rating brings down or improves its final score. At the end of the day, you want to feel satisfied with your choice and have a countertop that is both beautiful and durable. Hopefully, this scoring system will make that choice a little easier. And remember, beautiful countertops won’t necessarily add value but they will make your home more attractive to potential buyers should you want to sell.